The US mobile broadband experience is the stuff of lore around the world, in part due to the smartphone revolution that first happened here, enabled by large, reliable wireless networks and innovative pricing strategies that made smartphones and Internet access a reality for hundreds of millions of Americans. But all is not well as they say. There are signals emanating from Washington DC these days that indicate the country may be going down a road of short-term compromises that will impact America’s wireless consumers for decades. Recently the FCC announced the channel configuration for the AWS-3 band. The FCC divvied up 40 MHz of the 67 MHz of spectrum originally allocated for AWS-3 and made it available for auction to wireless carriers as a single 10×10 MHz license, three 5×5 MHz licenses, including one 5×5 MHz license allocated across each Cellular Market Areas (CMA), and the other licenses allocated across Economic Areas (EA). The FCC appears ready to continue the narrow channelization idea for the upcoming incentive auctions intended to reallocate up to 120 MHz of broadcast spectrum to wireless broadband. By embracing more narrow spectrum channels as a preferred policy, the FCC has set itself on a path that forces wireless operators to either accept slower network speeds or significantly higher capital expenditures in the US, an outcome that is out of sync with both technology innovation. This decision comes just as global trends in competing markets and America’s insatiable demand for video delivered to their mobile devices come to head. Europe, Asia and Latin America have been embracing wider channel sizes for a while. 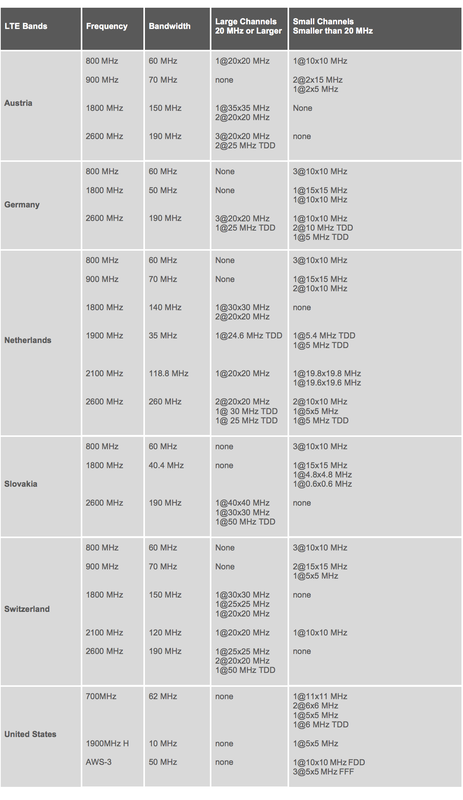 For example, for its most recent spectrum auction, Switzerland decided to use spectrum allocations of 20×20 MHz while refraining from dictating what technology the winner bidders could deploy. Below are additional examples of the global move towards wider channels, consistent with the evolution and deployment of LTE network technology. Why the global trend to embrace wider channels? It’s all about providing higher speeds at lower cost for the data hungry masses of smartphone users. The faster the network speed, the better the quality of video and data bits traversing the network. The lower the cost, the more people can actually enjoy wireless data services. And the impact that channel size has on network speed is quite direct. Because wireless bandwidth is a shared resource, the speed with which packets traverse a mobile network is the fraction of the total bandwidth available, divided by the number of concurrent users. 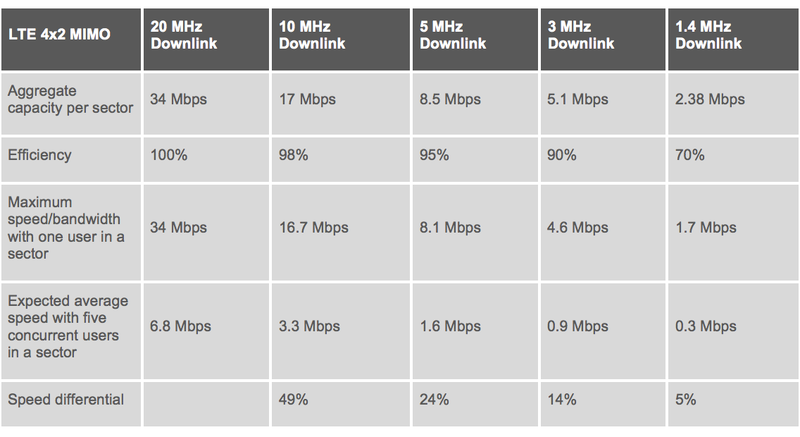 Consider the following chart that explains the relationship between network speed and the size of the spectrum channel. Wider spectrum channels make it easier to deliver faster speeds for accessing and downloading content as the wireless carriers have to manage just one contiguous channel. This is caused by what engineers called trunking efficiency, which means that resources from a single larger channel can be more efficiently allocated than from separate independent channels. In effect, channel sizes impact the design and cost of the network. The faster the speed, the more satisfying the experience which prompts more usage and so the cycle goes. The most obvious advantage for consumers is that videos, which represent more than half of all bandwidth consumed on mobile networks, can be viewed without interruptions and at a higher quality than video delivered over narrow spectrum channels. Small businesses can more easily use video conference services, healthcare providers can more effectively use video for instruction or treatment, schools and libraries can more cheaply use video-based instructional tools and companies relying on mobile ad revenue for their next billion in revenue will be well served. While Europe, Asia and Latin America are embracing the technical benefits of innovation by licensing wide channel sizes, the US remains solidly grounded in the thinking of the 1990s – when small channel sizes were technically sufficient and politically appealing as a way to entice small companies into the wireless industry. Today the FCC is making a trade-off between allocating smaller bands of spectrum to more people, rather than allocating wider spectrum bands that will allow network operators to provide faster and/or cheaper data on average. The fact that not only Europe, but also Asia and Latin America are making spectrum available with much wider channelization than their US counterparts is significant. It should come as no surprise then that wider spectrum channels are creating superior outcomes for the wireless broadband networks in these countries. Operators around the world will be able to provide their customers faster and/or cheaper wireless services while boosting the economic and productivity improvements that the proliferation of more and faster wireless service has been shown to produce. Putting the U.S. on a path away from this global trend makes it much harder to maintain the wireless data leadership that this country has enjoyed. The best path to maintaining America’s global leadership in deploying LTE networks that offer the fastest speeds accessible by the greatest number of consumers at the lowest possible cost is to license spectrum consistent with how technology has progressed and in sync with global spectrum allocations. Today, the best quality of service for delivering mobile data is achieved with channels that are 20 MHz and larger. Ultimately, there we can have two out of three: higher number of licenses, faster speed, lower cost. If US policymakers only offer spectrum licenses with small channel sizes, like they have decided to do with AWS-3 and is rumored to be considering for the incentive auction, it should come as no surprise if other countries will enjoy faster data speeds and the United States increasingly falls behind in global wireless rankings.